In January, I won a copy of the newly released novel Three Good Things through a Goodreads giveaway. The story is about serendipity, and I consider it serendipitous that I won because I was craving a light, fun read after spending two full days preparing my tax returns. This novel is great for a lazy Sunday afternoon, and a relatively quick read at 235 pages. There’s also a discussion guide at the end, making this a good pick for book clubs. 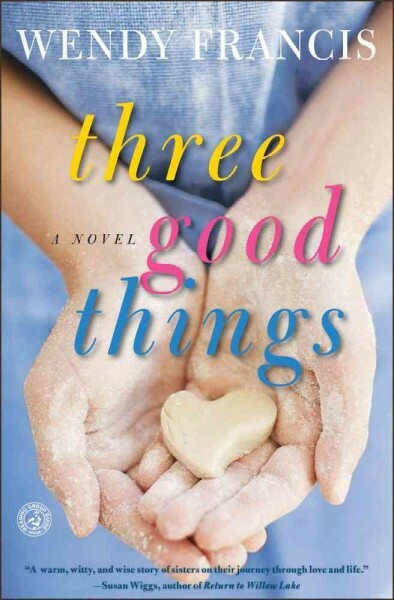 Three Good Things is centered around the lives of three main characters in small town Wisconsin. There’s Ellen McClarety, a recent divorcée in her mid-40s who has recently opened a small bakery that specializes in the Danish pastry, the kringle. Her younger sister, Lanie Taylor, is a family law attorney in nearby Madison and an overprotective new mom to 10-month-old Benjamin. Lanie’s husband, Rob, is a hard-working architect, who feels under-appreciated by his firm. None of these characters is especially extraordinary, and that is the beauty of the book. As they go about their daily lives, struggling to achieve balance and a sense of peace, Ellen and Lanie remember a piece of advice their long-deceased mother had told them: “At the end of every day, you can always think of three good things that happened.” It is through experiencing gratitude in the small things that we truly find peace and purpose in our lives. As much of the story takes place in Ellen’s bakery, it is fitting that a recipe for Danish Kringle is included at the end of the book. Of course, I had to try it. 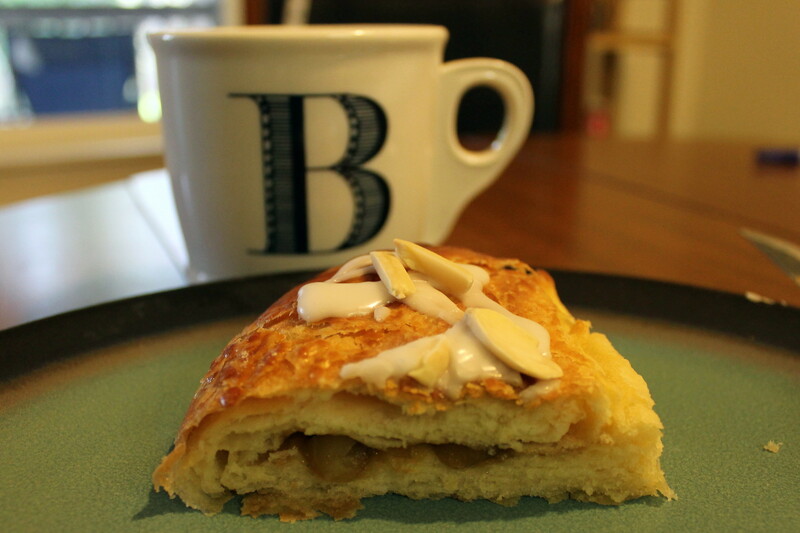 While traditionally in Denmark the kringle is similar to a pretzel, in the Americanized version that’s featured in Three Good Things it is a long pastry filled with fruit and/or nuts. I made the apple version that is featured in the recipe, but once you master the technique, it would be easy to try other concoctions such as blueberry, raspberry or rhubarb. With its light, flaky, buttery crust, the kringle is reminiscent of a croissant, yet it only takes about 3 hours to make compared to the nearly 3 days it takes for the perfect croissant. For ingredients, you will need ¾ cup butter (1 ½ sticks), 3 ¼ cups all-purpose flour (I used unbleached white), 1 package active dry yeast, 2 eggs, ¾ cup of milk, 3 tablespoons sugar (I used organic cane sugar), 1 teaspoon salt, 1 ½ cups of chopped and peeled apples, ½ cup brown sugar or coconut palm sugar (I prefer the latter because it is minimally processed), ½ cup powdered sugar, 2 teaspoons milk, ¼ cup sliced and toasted almonds. To begin, cream the butter with ¼ cup of flour. Place between 2 sheets of parchment paper and roll to a 10 x 4 inch rectangle. Place in refrigerate to chill. Soften yeast in ¼ cup of warm water (it is important the water temperature is ca. 100-110*F so the yeast does not die). In a large mixing bowl, combine 1 egg, ¾ milk, 3 tablespoons sugar, 1 teaspoon salt and yeast/water mixture. 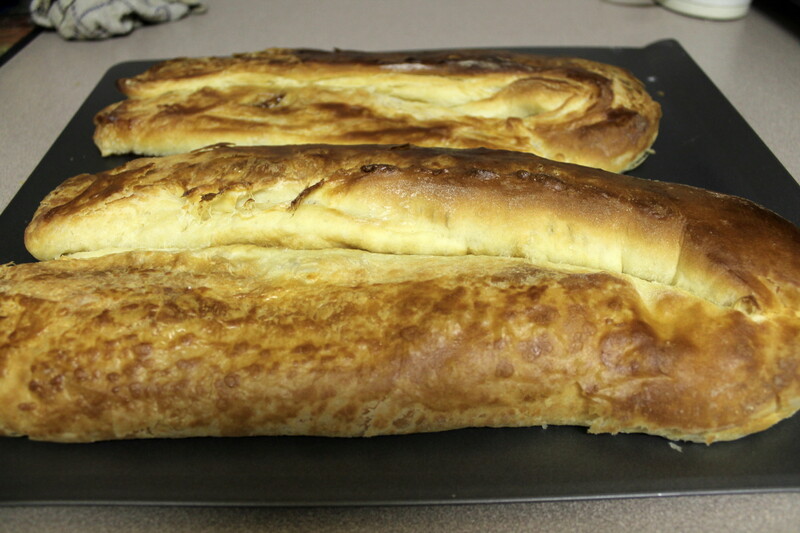 Add remainder of flour 1 cup at a time and knead until you have a soft, slightly sticky dough. On a clean, floured surface, roll dough into a 12-inch square. Place chilled butter in center. 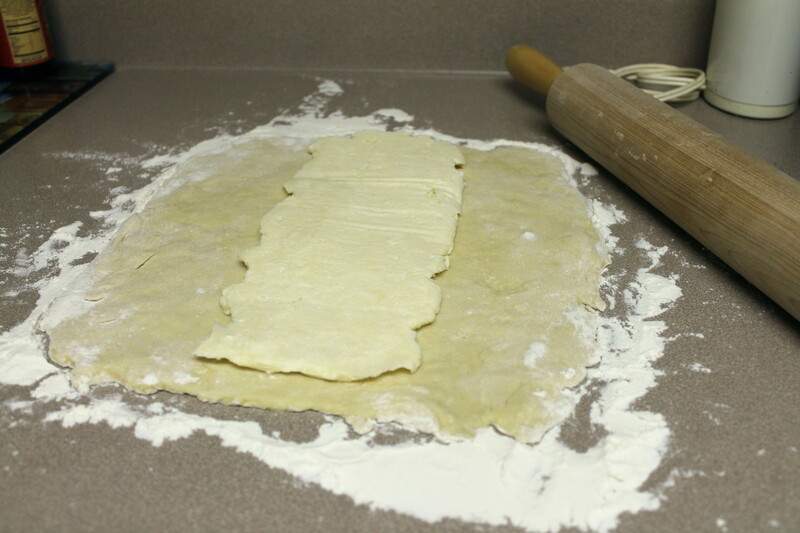 Overlap sides of dough atop butter, turn dough ¼ way around, and roll into another 12-inch square. Repeat this process twice more. Wrap in parchment paper and chill for 30 minutes. Roll to a 24 x 12 inch rectangle and cut lengthwise into 2 strips (I used a pizza cutter). In a small bowl mix the apples and brown sugar or coconut palm sugar. Evenly spread each strip with filling. Moisten edges with water and seal. 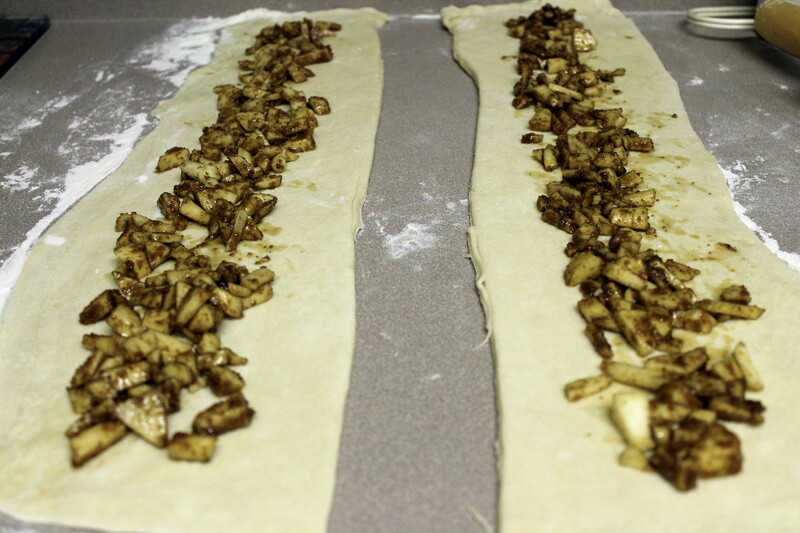 Stretch each pastry to approximately 30 inches without breaking. Shape into an oval and place on a greased baking sheet or non-stick baking sheet. 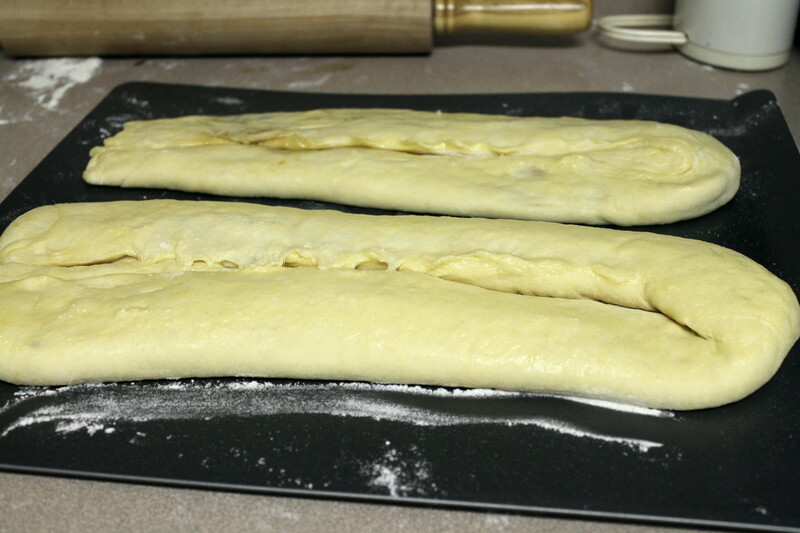 Flatten to ½ inch with a rolling pin. Brush kringles with a beaten egg. 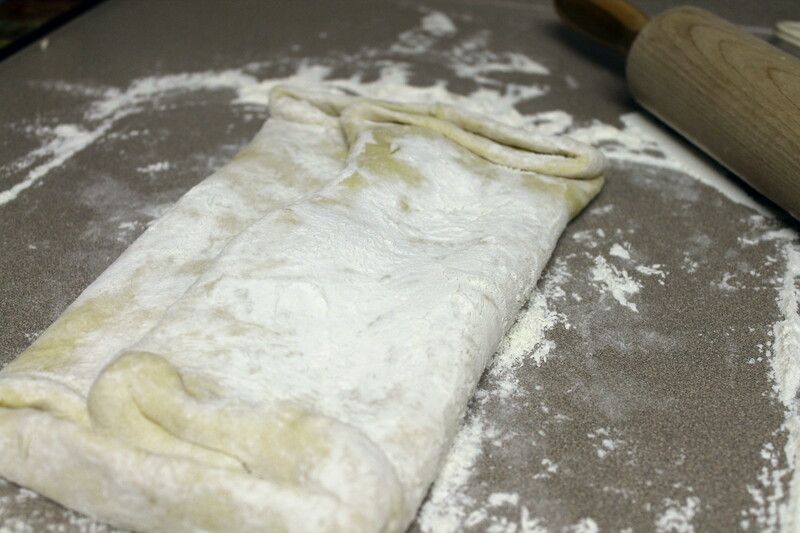 Cover with plastic wrap and let rise until dough doubles, approximately 30 minutes to 1 hour. Preheat over to 375*F and bake for 25 to 30 minutes, until kringles are a golden brown. Cool on a wire rack. Meanwhile, mix up some icing with ½ cup powdered sugar and 2 teaspoons milk. 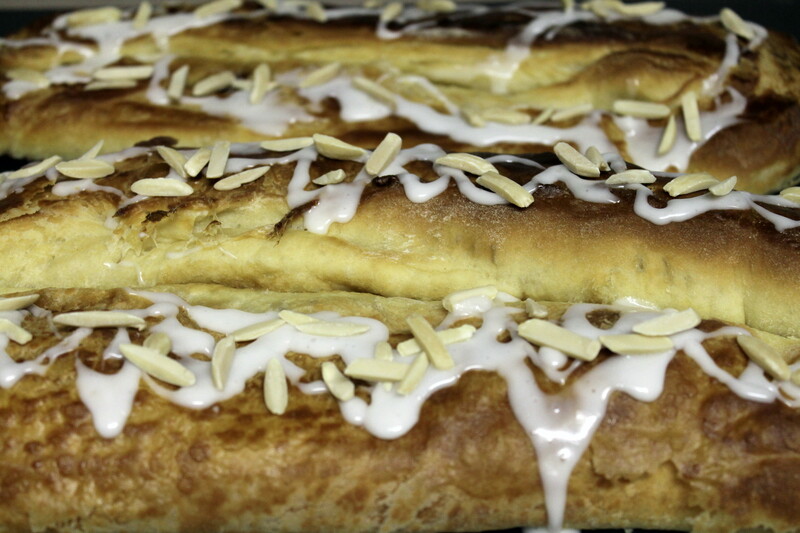 Drizzle kringles with icing and top with toasted almonds. Voilà! Breakfast for the next week. This entry was posted in DIY, Movie Reviews/Book Reviews, Recipes and tagged Baking, book clubs, book reviews, breakfast, Danish, fiction, pastry. Bookmark the permalink. The books sounds like a fun read, and the kringle is something I’m definitely going to make for the office. Great post!